Say goodbye to mice, rats or roaches, chemical-free! 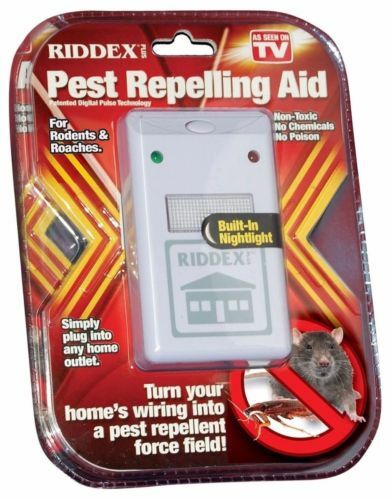 Drive unwanted pests out of your home with Riddex(r) Plus. No poisonous chemicals or messy traps, just plug in Riddex(r) Plus and the wiring in your home creates pulses that pests don't like. Covers up to 2000 sq. ft. (on one level). Cats, dogs and other pets can't hear it. Indicator light lets you know when it's working, and it includes nightlight.